A lobster roll is one of my favorite things to eat at casual seafood places. Lately, I feel like it’s been popping up more and more in local Los Angeles restaurants becoming fairly hip. 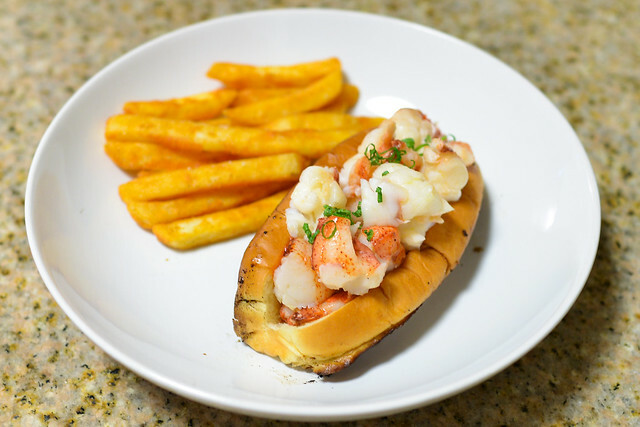 Renditions from Hinoki & The Bird and Son of a Gun have received national attention, while we have trucks/restaurants (Lobsta Truck & Cousins Maine) dedicated to the sandwich. We even have our own lobster roll event called the Lobster Roll Rumble. It’s such a simple thing – really, at its simplest, all you need is lobster, butter or mayo, and bread. Perhaps that’s why it’s spreading so quickly from menu to menu. Being primarily made up of a rather expensive ingredient, a lobster roll is frequently the most expensive item on a menu. Easily reaching into the mid-$20s and, sometimes, low-$30s (I’m looking at you Water Grill!) I often think twice about ordering something so common that is not likely to fill me up. Appearing easy to make at home, I’ve often thought about making my own for much cheaper…and finally did. 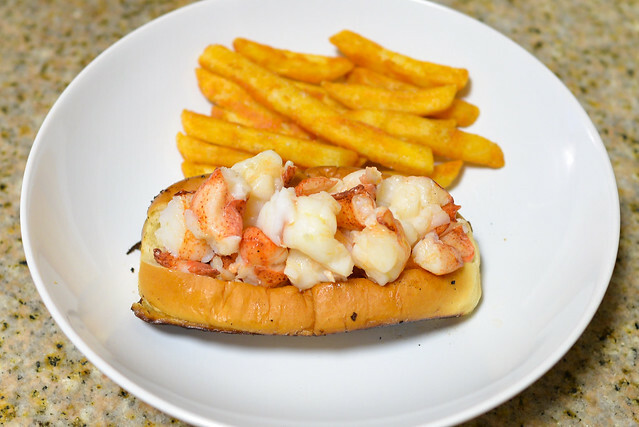 I have a pretty good idea of what my ideal lobster roll is. A warm, buttery and toasted bun is key. Of course, perfectly cooked lobster lightly covered in butter (I’m not a cold mayo lobster roll kind of guy). And, I like little to no filler – just the lobster for me. To me, the keys to success were finding split-top hot dog buns (a relative rarity here) and perfectly cooking the lobster. No one likes overcooked, rubbery lobster. The first key was solved at my local Korean market which doesn’t seem to disappoint when I’m looking for random things. 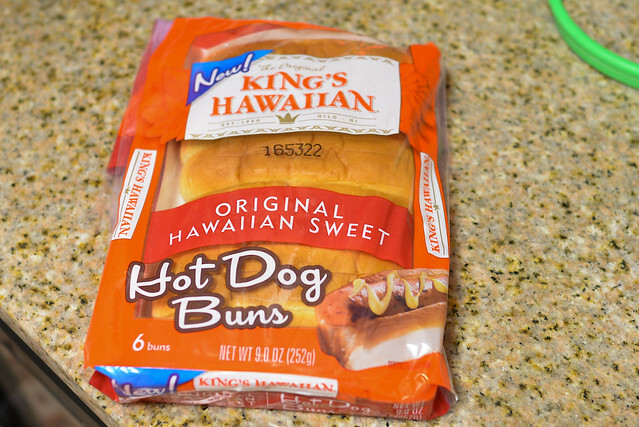 I grabbed a package of King’s Hawaiian’s version of hot dog buns. 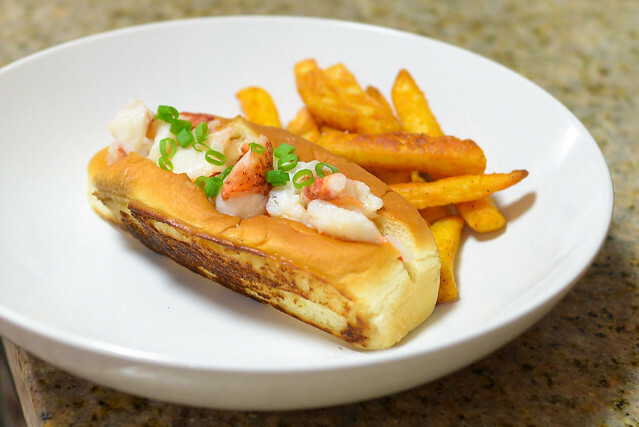 Not only is the presentation of split-top buns more traditional for a lobster roll, you just can’t get two nicely-toasted sides on a side-split hot dog bun. 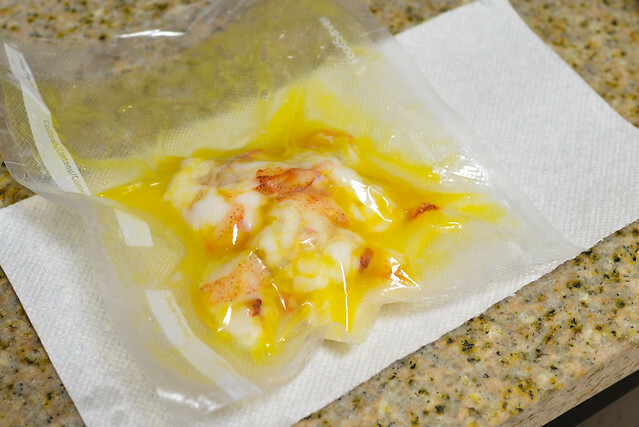 I solved my second key by poaching the lobster in butter sous vide. This would ensure perfect, even doneness and the poaching butter could easily be transferred to the assembled roll. With the steps in place, I began the process by purchasing two live lobsters. Similar to what I did with the lobster risotto, I dispatched the lobsters, blanched them, and broke them down for further cooking. Bite-sized pieces of the claws and tails were vacuum sealed along with a few chunks of butter. 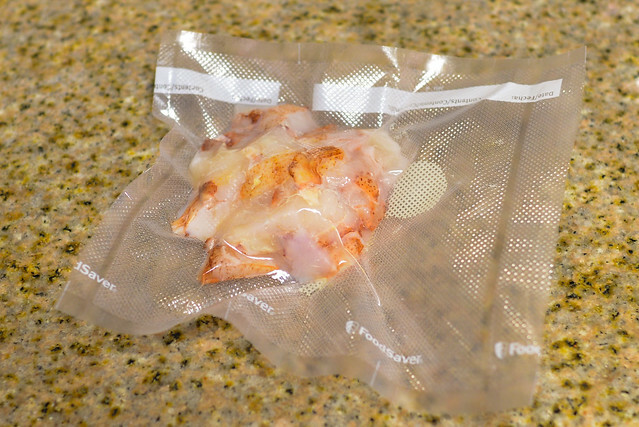 I set my water bath at 135F – 30-45 minutes would be all I needed for the lobster to come to temperature. Just before the lobster was ready, I toasted up both sides of the bun. This was actually a little harder than it seemed; I went through a few buns before I got the golden-brown, crispy sides that I wanted. Once the buns were toasted, I moved quickly to assemble. 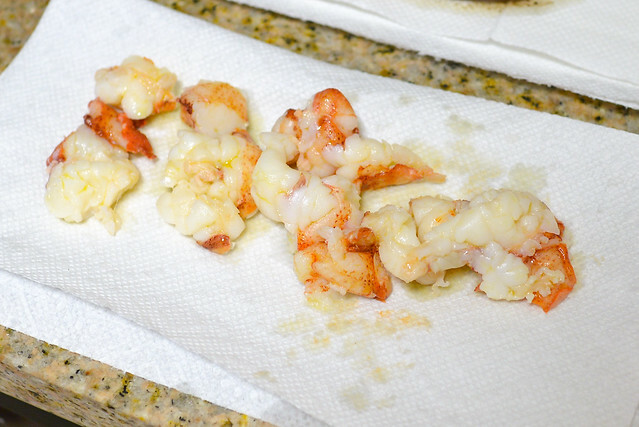 The lobster was removed from its plastic pouches, very lightly draining on paper towels. I stuffed as much lobster as I could fit into the bun without it bursting – pretty much how it should be! A few drops of the residual poaching butter and freshly chopped scallions and this lobster roll was ready to eat. French fries were an ideal accompaniment. I was pretty happy with how these turned out, so much so that I felt guilty about gobbling them up so quickly and not slowly savoring them. The lobster was cooked perfectly, yielding a really nice springy texture. The warm bun was soft and added just a bit of crispy texture. Finally, the scallions provided a subtle, fresh bite in each mouthful. I’d definitely make this again. Dispatching and breaking down whole lobsters is a ton of work, but I always hear that it’s worth it. I would probably experiment with using high-quality frozen lobster tails and claws next time. It would be a great shortcut if quality isn’t significantly sacrificed. A lobster roll-making party sounds like a fun evening one of these days, hmm?